The income and expenditures of the average Korean nose-dives around retirement age by roughly one-third, driving up the country’s already-high poverty rate of senior citizens, a recent report by a state-run think tank showed. 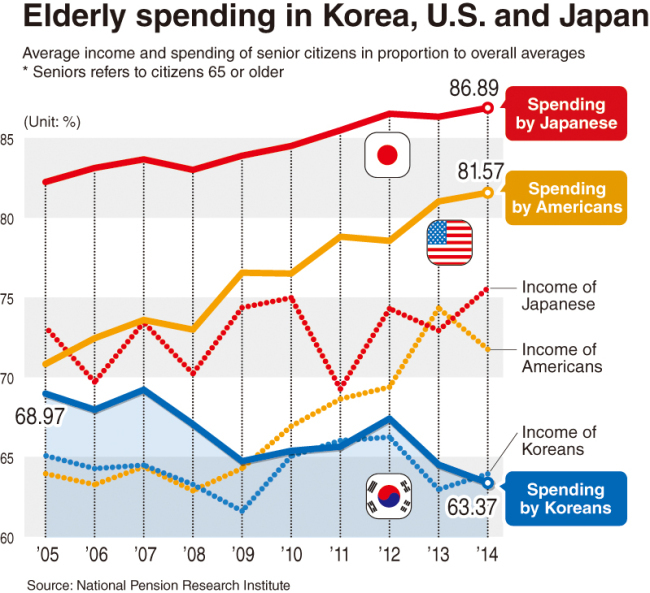 The average Korean senior, aged 65 or older, made roughly 63.93 percent of the average Korean's income in 2014, while their spending was 63.37 percent, according to Sung Hye-yeong, a researcher from the National Pension Research Institute. The figures were in stark contrast to the U.S. and Japan. In the same year, the elderly in the U.S. spent 81.57 percent and had an income of 71.75 percent of the general population, while the figures for Japanese seniors were 86.89 percent and 75.58 percent, respectively. The Organization for Economic Cooperation and Development’s “Pensions at a Glance 2015” showed that 49.5 percent of Korean seniors were below the poverty line -- marked at half the median household income. “There is a notable disparity between the incomes of elderly households and non-elderly households in Korea, which results in senior citizens spending their money mostly on items closely linked to their survival,” said Sung in her paper “Comparing Income and Expenditure of Seniors in Korea, the U.S. and Japan” published in the journal “Pension Forum” by the NPRI. According to Sung, Korean seniors spent only 5.2 percent of their income on leisure, compared to the 5.8 percent overall average. But American and Japanese seniors’ spending on leisure activities -- in proportion to their income -- increased from 5.9 percent to 6.2 percent and 9.9 percent to 10.1 percent, respectively, flashing warning signs for Korean seniors’ quality of life. Sung pointed out that the discrepancy derives from the country’s pension system. As of 2013, an average pensioner received about 16.31 percent of the average household income in Korea. But the Old-Age, Survivors and Disability Insurance federal program in the U.S. offered 34.59 percent of the country’s average income, while Japan’s pensioners got 64.77 percent of the average income. The Police Science Institute recently predicted that the crime rate of the elderly is likely to surge this year, due to their high poverty rate.